Social Media Day is celebrated worldwide every end of June to recognize how social media has revolutionized the way people communicate and interact. 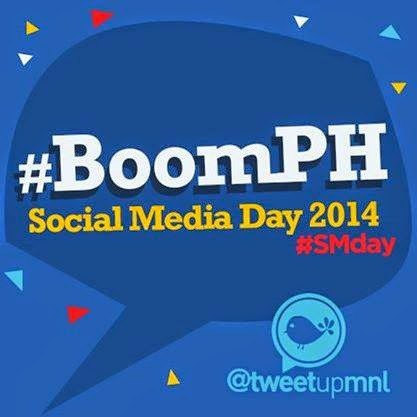 Last June 28, 2014 at SM Aura, Social Media Day was staged by TweetUpMNL and various partners. More than 1,000 participants representing 25 various communities attended the activity in Manila. In line with this, Smart also supported similar community events in the cities of Davao, Cebu, Baguio and General Santos by way of connectivity and sponsorship. Smart Communications, Inc. (Smart) encouraged members of the various social media communities celebrating Social Media Day to be better prepared for disasters and emergencies as part of its #SafePh advocacy. According to Ramon R. Isberto, Public Affairs Group Head at Smart "Promoting the culture of preparedness couldn't have come at a better time as the Philippines observes the National Disaster Consciousness Month this July. We call on everyone to continue using social media for the common good”. Smart tapped one of its #SafePh partners, Louie Domingo, executive director of non-government organization Emergency Research Center, to share practical tips on creating one's emergency balde (plastic bucket) or e-balde. More than just a container for liquids, the e-balde can also be used to hold emergency preparedness items such as bottled water, flashlight, lighter, candle, multi-purpose tool, first-aid kit, pea-less whistle, extra clothes, radio, lifesaver or salbabida, umbrella, and food items that don’t need cooking and have longer shelf life. Louie Domingo of Emergency Research Center, and a partner of Smart for its disaster preparedness initiatives, shows the contents of the emergency balde (e-Balde) at the Social Media Day Manila. Smart distributed sample emergency kits to representatives of each of the social media communities that participated during the event. The sample emergency kits will serve as their guide on the basic items that one needs to have in preparation for disasters and emergencies. As a key pillar under its corporate social responsibility (CSR) program, Smart has been actively promoting the culture of preparedness not only within its ranks but also with partner-communities, including the millions of its subscribers, and the public in general, under the SafePh advocacy. Social Media Day team from General Santos City. In partnership with developer communities, Smart has been promoting the development of mobile apps to aid in disaster preparedness, management, and response like Project NOAH Mobile (the mobile version of the Department of Science and Technology’s Project NOAH site), PINDOT or Provincial Information Network on Disaster Occurrences and Threats (used by the Province of Albay for its disaster management initiatives) and Batingaw (to be used by the National Disaster Risk Reduction and Management Council for disaster management).